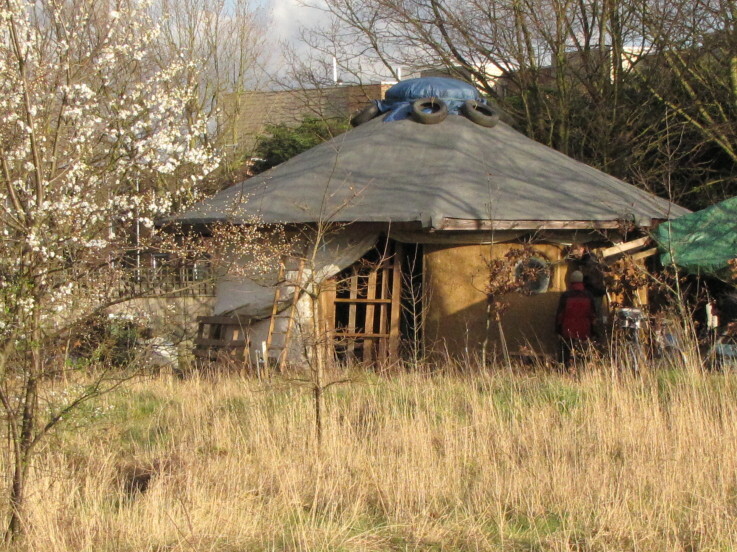 Meadow Orchard Project has constructed a community round-house with the help of many volunteers. The building was designed by architectural designer Abigail Stevenson and uses natural building methods and sustainably sourced or reclaimed materials. It is a timber frame structure with reciprocal roof rafters, which was constructed by Wood Works Wonders (Selby Trust). The walls are made of cob built by volunteers, with the help of Cob in the Community, and straw-bales. The building utilises natural light, and the thermal and insulating properties of natural materials for energy efficiency. Our finished building is a beautiful and soulful space for workshops, classes, therapies, meetings and community events. The foundations are laid with recycled crushed concrete; the frame and roof rafters are constructed with high-quality reclaimed timbers; the roof is clad with reclaimed pallet slats; the stem wall is made using rammed-earth recycled tyres; the south wall is a cob mix of clay, sand and straw; the north wall is straw-bales rendered with natural lime and clay plaster. A wooden floor has been laid with reclaimed boards on a floating sub-frame with recycled insulation underneath. The windows are reclaimed glass-frames or donated triple-glazed seconds from Ecodomus. The doors and shutters are made from pallet wood and reclaimed timbers. 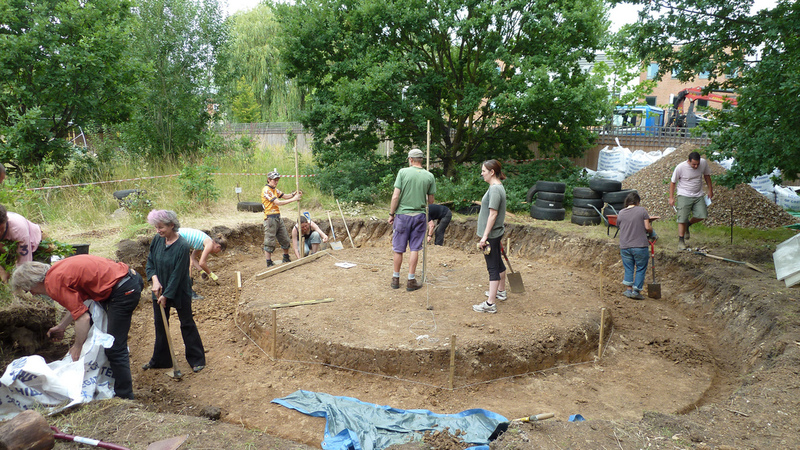 A team of committed volunteers have been running building volunteer days. If you want to gain skills in eco-building, carpentry, cob-building etc please come along. See our events page.